This Cranford Sister Act Puts the “OM in “HOME”! 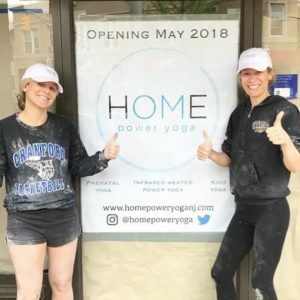 Katie Snyder Tierny and Elizabeth Snyder – the fabulous new owners of the upcoming “Home Power Yoga” at 8 Eastman Street in Cranford (www.homepoweryoganj.com) – are seriously the cutest, most inspirational sisters. Their love for the practice of yoga and this community is literally beaming out of their beautiful smiles and laughter. I had the best time hearing them talk about their upcoming opening and why they wanted to create their own studio. It’s truly rare to find just genuine contentment, peace, and happiness in someone – but they both possess each quality! Both of these beautiful women have such admiration for each other and their unique talents in the practice of yoga. It was so evident that they want to just share yoga with everyone and build a true community and “home” within their studio. I have no doubt that once they open their doors – the love and will shine forth and everyone will find their own special place. The emptiness will soon be filled with people who have come together not only for yoga – but for what Katie and Elizabeth have created. 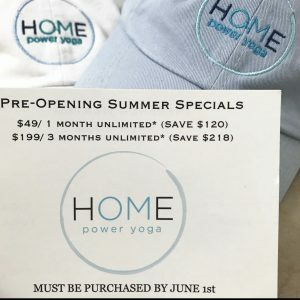 I am so excited for them and this new power yoga studio in our town! Katie and Elizabeth are both from Cranford and have lived here their whole life. Cranford couldn’t keep them away for too long when they both went away to Pennsylvania for college. They explored life outside this river town for a bit but felt compelled to come back their roots. After all, they are from a HUGE family!! There are eight total children and their mother was one of ten! This phenomenal family is quite known around town because they are all so super nice, giving, and they live around the corner from each other! These sisters grew up around their amazing mama – who was “crunchy granola before that was even cool!” She studied yoga in Vermont and came back to teach lessons at the Cranford Community Center. She joined a co-op, made natural peanut butter, and concocted her own almond milk from scratch! This strong mother raised her children to lead healthy lives! After interviewing Katie and Elizabeth about why they wanted to own their own studio – I have no doubt that this was the very thing they have been waiting for their whole lives! They were meant to do this! Elizabeth: Here’s this practice that changed our lives – and it’s so transformative! We want to give back to this community that we love so much! Katie: We believe in this practice so much! Why did you decide that now was the time to open your studio? Katie: When I’m teaching yoga, I always ask, “What do you want to do and what’s holding you back?” It’s usually fear – there’s always an excuse. We are not living our true purpose. What do you love and why aren’t you doing it? I can’t tell them to live that and not do it myself! Elizabeth: My responsibility in life is to do this for my community. I know this because everything magically worked out – the space, how we pulled the money together, and how easy the whole process has been! We received so much support and we have so much to give back to everyone! Elizabeth: We had faith that it would all work out. And it was crazy how everything fell together. 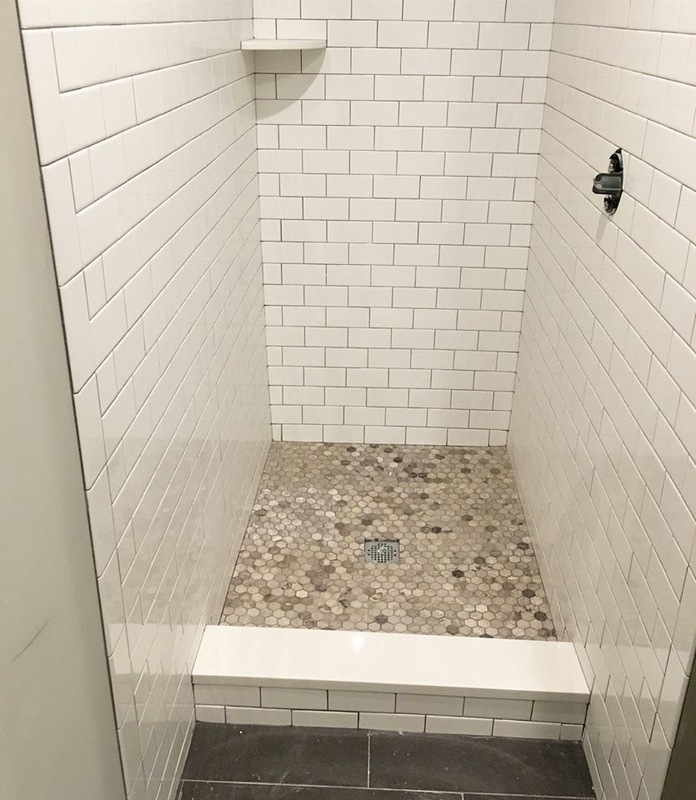 We found this cross-fit space right away. So, we literally walked in and started creating this studio with nothing – there were no floors except cement. It was a huge space! Elizabeth: We have spent a lot of weekends with family. 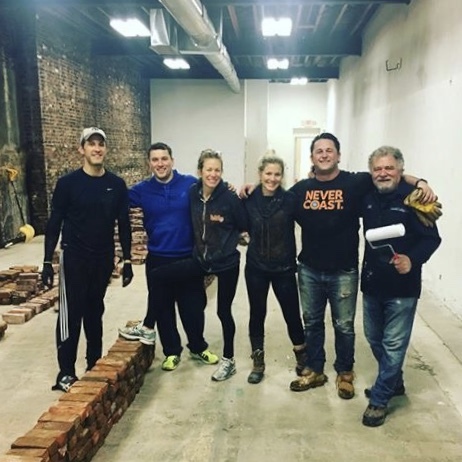 We hired people for the walls but everyone in this community came together to transform the space into two studios, two showers, a locker room, and infrared heat yoga rooms! What exactly is Power Yoga and how is it different than regular yoga? Katie: It’s access to vitality! The word doesn’t mean “super challenging”. It’s empowering, a very powerful practice, and yes – you sweat a lot! Katie: One of our rooms is infrared – it heats objects and not the air. It’s great for detox, injuries, and inflammation. And, unlike the sun, it’s not harmful to you! And maybe – just maybe – babysitting for one morning class! 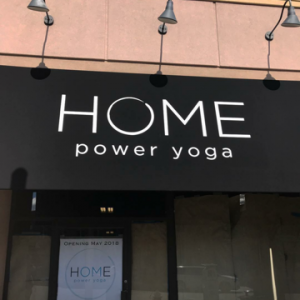 How did you come up with the name “Home Yoga”? Elizabeth: Our whole family is in this “family chat” and we were asking what we should call our studio. Once “Home” was mentioned, everyone just unanimously fell in love – and Cranford IS our Home!! 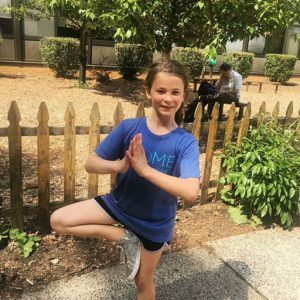 Katie: We wanted to create a home and loved that the yoga term “OM” fit nicely inside! We want to create a community! Elizabeth: It’s more than just physical! It’s “asana” – a tool for building a community! 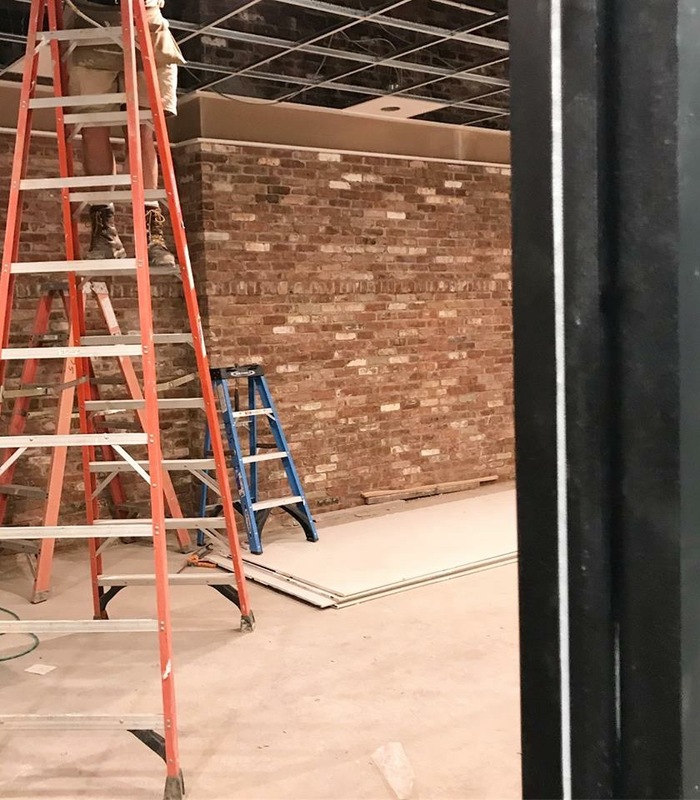 So how will your yoga studio differ from others in town? Katie: What we are creating is so exciting. We have such an amazing lineup of 9-10 teachers – they are just phenomenal and so talented. 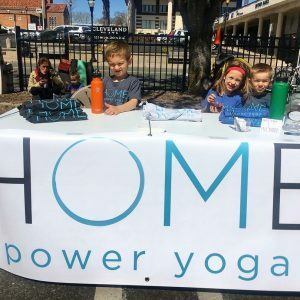 Elizabeth: More than the practice…we are building a community at Home Power Yoga. We just want to make others great! Just read their Mission Statement!! Katie: We can accomplish so much – I just don’t know where to start! We will be offering these very important community classes! Elizabeth: I have had the opportunity to work with the Africa Yoga Project (https://www.africayogaproject.org/) This non-profit organization in Kenya provides free yoga teachers, free yoga mats, and provides access to this practice. Our community classes each week are $5 and 100% of proceeds will go directly back to this organization. How can the community schedule a class? What’s next for this sister act? I mean – it’s so great that we have so much to give – great teachers, ongoing learning. We love that Elizabeth travels far away to learn more for this practice! And your “take-away” for starting your own business? Katie: “Breath” and know that we don’t have control over everything. Challenging things are how you grow! Elizabeth: Opening a business is really hard. We realized how much support we got from our family and friends – it truly shocked me. We have so much gratitude! Katie & Elizabeth: It wouldn’t have been possible without our family and our “home”!! So, hurry up and sign up for classes – folks! You have a new “home” in Cranford!